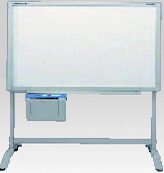 The UB-5315 Electronic Copyboard takes notes instead of you and improves your presentations and meetings. The UB-5315 comes fully equipped with an integral printer for easy operation and plain paper printing with multiple copies. The UB-5315 Panaboard can work as a PC printer, increasing efficiency and reducing meeting time. It also keeps 100% audience attention and increases participation. Panaboard UB-5315 comes with utility software that consists of Document Manager and Document Viewer. The meeting contents on the Panaboard screen will become meeting minutes with some annotation by Document Viewer Function. The Document Manager makes it easy to file and distribute the meeting minutes quite easily. Supported saving file format is BMP, TIFF, PNG and PDF. By just one click, you can scan the image on the Panaboard Screen as image data to your computer and from your computer; you can control the Panaboard function just like operating the Panaboard Control panel. In a meeting if you need to print out some documents, the plug and play of USB makes it easy to print out documents from the Panaboard.